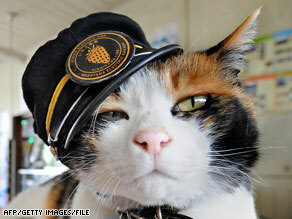 Troubled train company started promoting Tama as "Super Stationmaster"
KISHIKAWA, Japan (CNN) -- Tama is a 9-year-old calico cat, who used to live a simple life hanging out at the train station next to her home at the grocery store. Tama the "Super Stationmaster," in her hat cocked at a rakish angle, has become a sensation. But with the addition of a hat, usually worn at a jaunty angle, she's become a local, national and even international star. Tama's home of Kishikawa in Japan is an isolated town of just a few thousand people, the last stop on what had been a failing train line. They called her a "Super Stationmaster," made a promotional poster for train carriages and gave her that stationmaster's hat. "It's a chance to take a break from the problems facing Japan," said Haruto Maeda, who took the day off work to see Tama. She's the prize of the town's locals who say that in these tough economic times they'll take a gift horse -- or cat -- wherever they can get it.